. 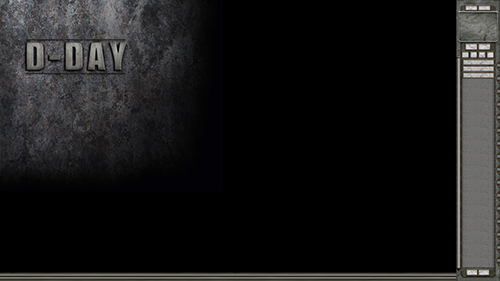 :Welcome to the D-day website:. 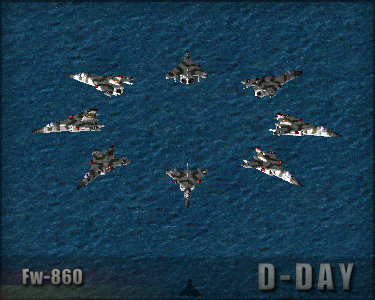 D-day is a modification for the highly acclaimed computer game Red Alert 2 and its expansion Yuri's Revenge. 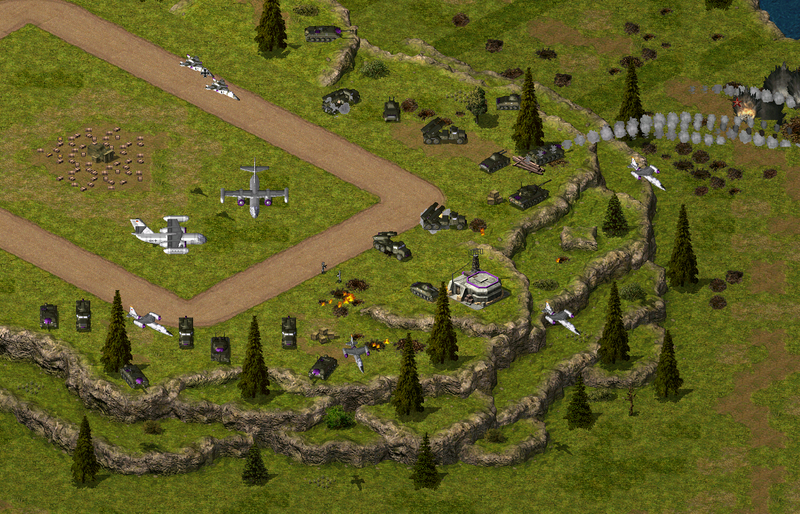 It changes Red Alert 2's original cartoony and arcade style gameplay into a more realistic World War II theme. 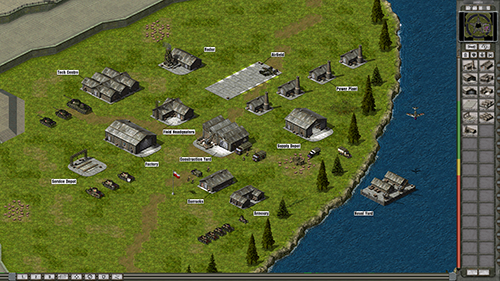 There are over a thousand new units to build and fight with, spanning from the early beginnings of the conflict in the 1920's onto a hypothetical what-if continuation of the war into the 1960's and beyond. If you have any questions please use the forums or leave a message in the shout box on this page. I'm back with a big news post covering the early development of German & Japanese jet aircraft with several Me-262 variants and copies. 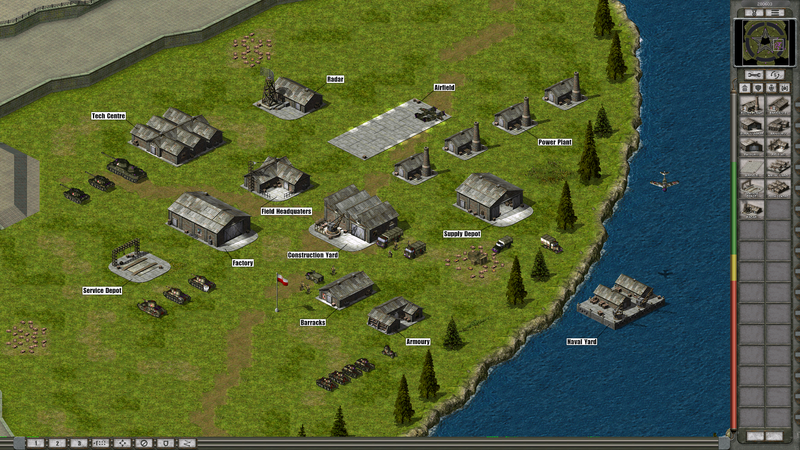 I actually made these units early last year & started writing the wiki pages for them last April! I'm glad I can now finally finish posting them. Another variant that I started working on but was unable to finish was the Me-262 C-3a, which featured an extra rocket engine in the tail for short speed boosts. 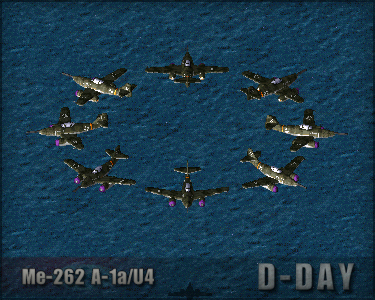 Due to limitations with the game's engine I was unable to get this system working, if it becomes possible in the future tho it will be added to D-day. I'd also planned to include the Soviet Sukhoi Su-9 & British Hawker P.1048 with these but both are independent designs that only resembled/were inspired by the Me-262 tho. I'll make them both at a later date along with several other early Allied jets. The German Me-262 was the first mass-produced & operationally used jet fighter in the world. Work on this revolutionary aircraft started in late 1938 under the code name Projekt 1065, the initial design proposed in April 1939 differed considerably from the production version, the engines were mounted in the wing roots & the wings were straight. Development of the BMW 003 jet engines intended for the Me-262 was repeatedly delayed because of the many technical problems encountered with this brand new propulsion system. Because of these problems it was decided to move the engines to pods fitted under the wing to facilitate easy removal for maintenance. This change also necessitated a change of the wings to a swept configuration to compensate for the change in centre of gravity. The first "V1" prototype was ready in April 1941 however the BMW 003 jet engines intended for the aircraft weren't ready so a conventional Junkers Jumo 210 engine with a propeller was fitted to the nose so basic testing of the airframe could be carried out. It wasn't until November 1941 that a pair of BMW 003 were ready to be fitted to the prototype. For the first test flight the Jumo 210 was retained for safety, which proved wise as both BMW 003 engines suffered a flameout causing them to stall, the Jumo 210 was then used to bring the prototype safely back to base. With this failure it was decided to switch to the more reliable Jumo 004 jet engines. The first flight with the Jumo 004 took place on July 1942 in the V3 prototype, marking the first flight of the Me-262 with jets only. There was opposition to the Me-262 from several high-ranking officials during early development including the head of Messerschmitt, who wanted to concentrate production on proven propeller designs. As well as the commander-in-chief of the Luftwaffe Hermann Göring who expected the war to be won before the aircraft could be ready for production, as such funding & support was withheld at times. After the Me-262 prototype was demonstrated to Hitler in mid 1943 he also insisted that the design should be modified into a multi-role fighter-bomber which lead to redesigns of the nearly finished fighter aircraft. These political problems along with the extended development of the jet engines meant that the Me-262 wasn't able to go into operation use until April 1944, six years after its original conception. Once in combat though it proved highly capable and able to outperform most allied fighters, with several pilots becoming aces. It was however extremely vulnerable when taking off or landing as it couldn't maneuver or accelerate during this time or the engines would stall. 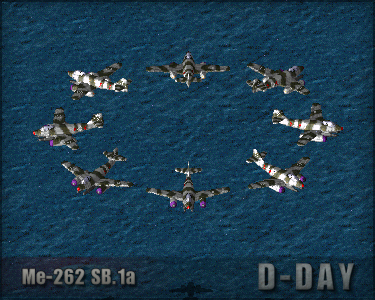 Allied pilots would take advantage of this by loitering around airfields & then attacking Me-262 as they appeared. To combat this the Germans reinforced the anti-aircraft fortifications leading up to the runway in order to give the Me-262 more cover. As the war situation deteriorated though most Me-262's were grounded because of fuel shortages & a lack of trained pilots that could handle the power of the new jet aircraft. Following the end of the war American, British, French & Soviet forces scrambled to capture these prized aircraft so they could be studied to advance their own jet aircraft programs. Comparative tests between the British Gloster Meteor & American P-80 Shooting Star showed the Me-262 to be superior in several aspects however the engines required constant maintenance & had a relatively short lifespan. As such these tests didn't last long and several aircraft were lost due to engine failures. Out of the 1,430 aircraft built during the war only nine still exist today in museums, with only one still in its original markings. In 2003 the Texas Airplane Factory started the "Me-262 Project" in which they built several replicas using an original Me-262 that was undergoing restoration as a template. Unlike most replicas, which are classified as unique aircraft, the exact replication of the parts used in these Me-262s meant that they are officially registered as newly built Me-262s with the variant name of A-1c. They are all owned by private collectors who often fly them during air shows in American & Germany. The Messerschmitt Me-262 A-1a/U4 (in some sources know as the Pulkzerstörer "Pack destroyer") was a modification of the standard Me-262 A-1a airframe, replacing the four 30mm Mk108 cannons in the nose with a single 50mm Mk214 cannon. The 30mm Mk108 while a powerful weapon had a short range which along with the Me-262's high speed meant that the engagement time against enemy aircraft was often very short, especially against slow moving bombers. The 50mm Mk214 greatly increased the damage and weapon range of the Me-262, even giving it the ability to engage bombers from outside of their defensive range. 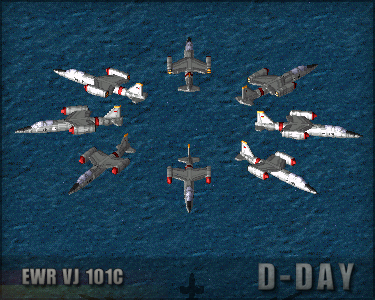 The weapon had a limited amount of ammunition and was difficult to use while manoeuvring though, making it unsuitable in a dogfight with other fighters. Only two of these aircraft were built Wk/nr 111899 & Wk/nr 170083 in early 1945, there are rumours that one of them was used in combat before the war ended but no evidence has been found to substantiate these claims. After the war Wk/nr 170083 was captured by American forces at Lechfeld airfield and transferred to the 54th Air Disarmament Squadron led by Colonel Watson (aka Watson's Whizzers), a unit which was tasked with finding and capturing advanced enemy aircraft. In preparations for transferring the aircraft back to American for testing its markings were repainted with USAF roundels and was named Wilma Jeanne after Watson's wife. It was then flown to Cherbourg where it was loaded onto the British aircraft carrier HMS Reaper along with other advanced German aircraft for the long journey across the Atlantic. Arriving in New Jersey the aircraft were then flown to Freeman Army Airfield, during the flight a turbine blade broke in the engine of the Me-262 A-1a/U4 and the plane was destroyed in the resulting crashed. The Messerschmitt Me-262 B-1a/U1 was a specialised night fighter variant of the Me-262 equipped with a FuG-218 Neptun radar for finding enemy aircraft in the dark. Development of a night fighter variant of the Me-262 started in late 1944 with the construction of the Me-262 A-1a/U2 prototype (Wk/nr 170056) which used the standard single seat A-1a airframe. Multiple tests were carried out using several different types of radar devices. While the technical sides of the tests proved successful the pilots however reported that they had difficulty flying and using the radar system simultaneously. In light of this it was decided to move development to the Me-262 B-1a two seater trainer airframe, the extra seat which was normally used by a flight instructor was instead modified for use by a dedicated radar operator who could guide the pilot to enemy targets. The addition of the radar antenna protruding from the nose produced extra drag and decreased the aircraft's speed, the space needed for the second seat required the removal of one of the fuel tanks too. To compensate for this loss two external fuel tanks were fitted under the nose, this also increased the drag and decreased the speed. 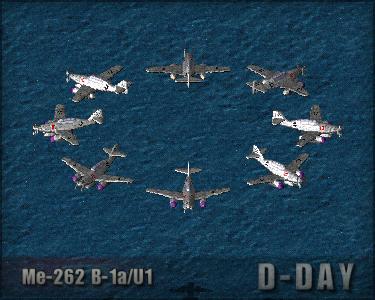 Even with this loss in performance the Me-262 B-1a/U1 was still much faster then the enemy bombers and their escorts. Messerschmitt started work on developing a more advanced version called the Me-262 B-2a which would have featured a lengthened fuselage to hold more fuel instead of the external fuel tanks and the new "Berlin" centimetric radar dish which could be placed inside the nose reducing drag, the war ended before work on a prototype of this improved version could begin though. 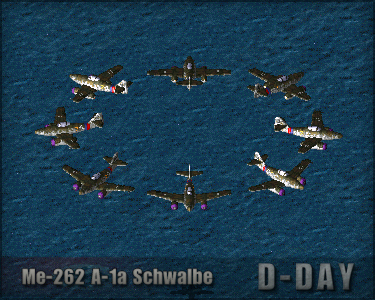 Only seven of the Me-262 B-1a/U1 night fighters were built before the end of the war, they were all given to the 10th squadron of the Nachtjagdgeschwader 11 who used them to great effect with several of the pilots becoming aces, including Kurt Welter who still holds the world record for the most enemy planes shot down in a jet aircraft. 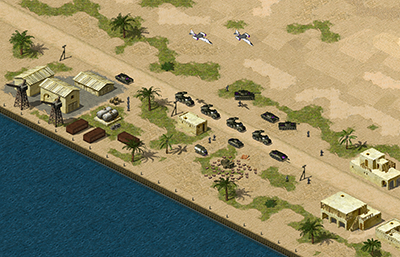 In an effort to neutralise this threat the RAF bombed the based they were operating from, after which only four aircraft were left. After the war the three remaining aircraft were captured by British forces who transported them back to Britain for testing, one of them crashed during a storm and another was scrapped. The third and final aircraft was given to the South African air force where it sat in storage for many years, it was then given to the Johannesburg Museum who restored it in 1971 and has since been one of their major exhibits. The Messerschmitt Me-262 A-2a/U2 was a dedicated bomber variant of the Me-262 featuring a completely new fully glazed nose section that would house a second crew member who would lay down in a prone position. From there he could get a clear view for level bombing runs or guide remote controlled ordinance towards their target. Two prototypes of the Me-262 A-2a/U2 were built before the end of the war, one of them was captured by American forces who presumably took it back to American for testing along with other advance German aircraft and later scrapped it but information on this prototype's final fate is scarce. One of the types of ordinance proposed for the Me-262 A-2a/U2 was the use of another Me-262 that has been fitted with explosives and converted into a pilotless flying bomb, with the Me-262 A-2a/U2 mounted on top of the pilotless Me-262 in a Mistel configuration. For take-offs they were both placed on a specialised trolley fitted with a rocket booster, after becoming airborne the trolley would then be jettisoned and collected for reuse. Once the Me-262 A-2a/U2 was within range of the target it would detonate the explosive bolts holding the two aircraft together. The bombardier in the nose of the Me-262 A-2a/U2 would then take remote controlled of the Me-262 bomb via radio and guide it to a collision course with the target. During World War II multiple factories in Czechoslovakian were employed by the Germans to produce different parts for the Me-262 A-1 fighter and Me-262 B-1 trainer aircraft. At the end of hostilities in Europe the factories and parts were captured by Soviet forces, all complete aircraft and some parts were taken back to the Soviet Union for testing. The jibs, tools and documents within the factories were handed over to the newly restored Czechoslovakian government though. Using some of the parts left by the soviets along with others newly constructed in the wartime factories Avia set to work to produce their own version of the Me-262 A-1 and Me-262 B-1. The first of the single seat aircraft the Avia S-92 was completed in August 1946 with the first two seater Avia CS-92 trainer flowing in December 1946. The aircraft proved to be difficult and extremely time consuming to make with many of the parts having to be individually hand made, making each plane slightly unique. As such only nine Avia S-92 and three CS-92 were completed over the next three years before production was discontinued. They served in the 5th fighter squadron as a training unit to help pilots get their first experience with jet aircraft. Most were scrapped in the 1950's but a single S-92 and CS-92 remain on display in the Prague Aviation Museum. Yugoslavia showed interest in buying the S-92 and CS-92 and placed an order for one of each for evaluation but didn't receive any aircraft. There are reports that Israel bought several S-92 and one of them exploded during a test flight in April 1950, however there is no evidence to substantiate this. There have been suggestions that the aircraft that exploded was really a Gloster Meteor that the British had secretly given to Israel for testing and it was claimed to be a S-92 to cover it up, while slightly more plausible this is still a matter of conjecture. In early 1944 the Japanese military attaché in Germany was shown the Me-262 along with several other advanced German aircraft. 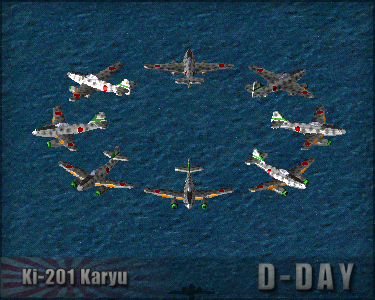 Impressed by these new designs he reported back to the Japanese high command on who then authorized him to open negotiations to buy a production licence for the Me-262 & Me-163. Documents for the two planes along with a complete Me-163 and other aircraft parts where then loaded onto the Japanese submarine I-29 in Lorient France and left on 16 April 1944 to take the perilous journey around Africa back to Japan. On 14 July 1944 the I-29 arrived in Singapore, several of the passages then disembarked and completed the rest of the trip by plane, taking some of the Me-262 documents along with them. Once resupplied I-29 also left Singapore to complete the finial part of it's journey back to Japan. 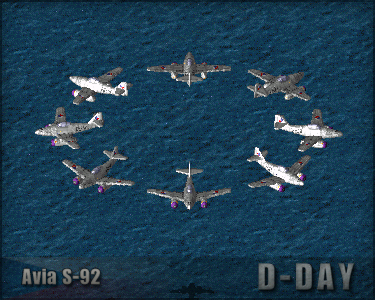 While going through the Luzon Strait though the I-29 was intercepted & sunk by American forces. With the loss of the I-29 & the parts it carried the engineers at Nakajima only had the few documents flown from Singapore along with the memories of a few offices who had seen the Me-262 first hand to work with. 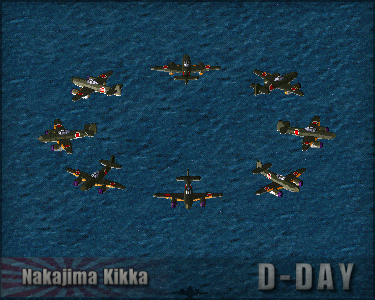 Even with this limited amount of information Nakajima started work on the Kikka in September 1944. Several changes where made to the original Me-262 design making it simpler and easier for manufacture in Japan including using more readily available materials such as wood. One major change was the addition of folding wings which would enable the aircraft to be concealed more easily. At first it was planed to fit the Kikka with the Ishikawajima Tsu-11 motorjet which was originally designed for use on the MXY7 Ohka kamikaze plane. Instead Ishikawajima started development of new jet engine specificity for use in the Kikka called the Ne-10, this design however was unable to produce enough thrust to power the Kikka. With this failure work moved to the Ne-20 which was a reverse engineered version of the German BMW 003, the engineers at Ishikawajima only had a few photographs and a cut-away drawing to work from though. Even with this limited amount of information they were able to produce a usable engine. The first prototype was completed in June 1945 and after ground tests it took to the skies for it's first flight on 7 August 1945 with with Lieutenant Commander Susumu Takaoka piloting. The short flight went well but the Ne-20 required a long time to get the Kikka up to takeoff speed. To elevate this on the second test flight the Kikka was fitted with RATO (rocket assisted take off) units, unfortunately the rockets had been fitted at an incorrect angle resulting in the Kikka crashing during takeoff. 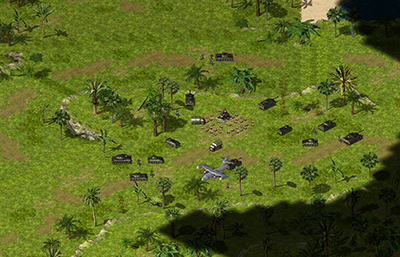 Work started on repairing the damage but the war ended before they could finish. A second prototype was also nearing completion at the time the war ended, along with around 20 other airframes in various stages of completion. After the war American forces captured airframes number 3, 4 and 5, they where sent to Patuxent River Naval Air Base in America for testing. The prototypes where later cannibalized to make a single complete aircraft, which was then given to the Smithsonian National Air and Space Museum. The Museum kept it in storage for many years but it has recently been moved it to the Steven F. Udvar-Hazy Center for restoration work. 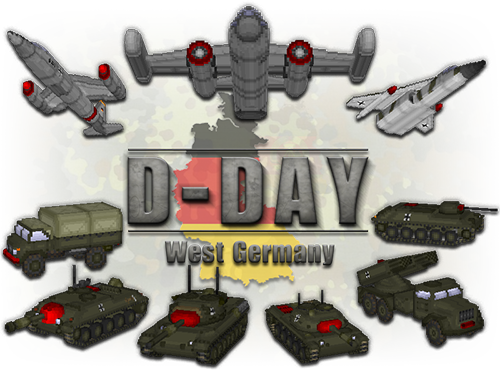 I am proud to announce the addition of West Germany to D-day as a new sub-faction. 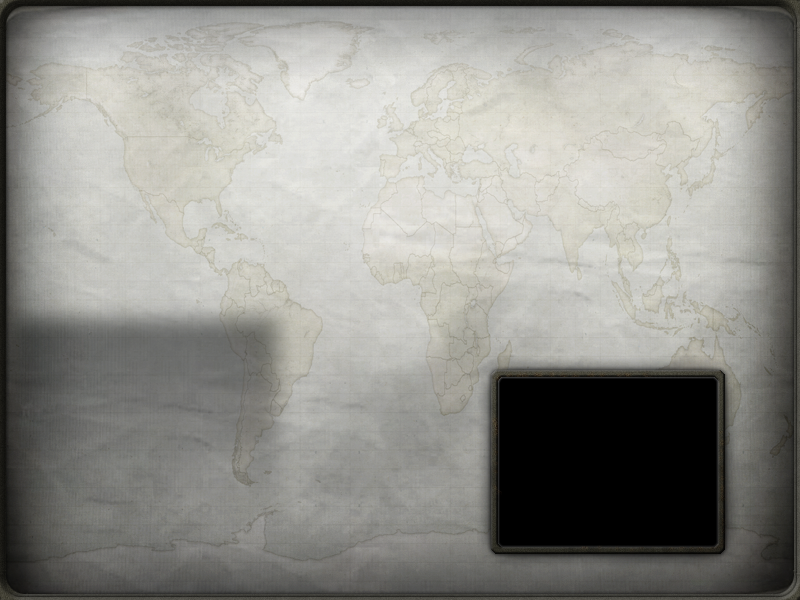 They will be playable in the Post-War time frame as an alternative to the Third Reich. 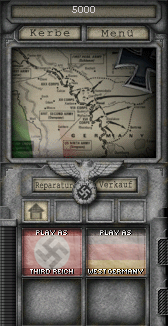 While the normal Third Reich faction makes use of prototypes and paper projects designed during the closing stages of World War II in a hypothetical scenario where the war continued on. The West German faction on the other hand uses equipment developed in the 1950's and 1960's for the newly established Bundeswehr, as in our real timeline. 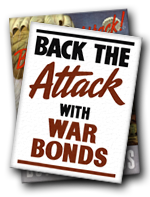 The addition of this sub-faction lets players create Cold War scenarios gone hot as you stand with you American and British Allies to fend off a Soviet invasion of Europe. Access to the West German sub-faction is done in the same manner as the American Marines sub-faction, where after deploying your construction vehicle you are given the choice of two factions to pick from. 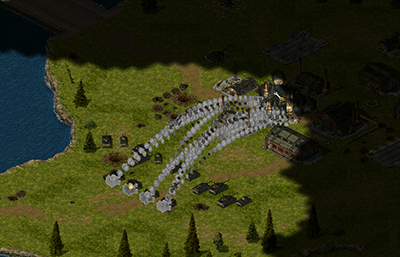 Once chosen you will not be able to change sub-factions for the rest of the game. Here is a more in depth look at the units available to the West German sub-faction. 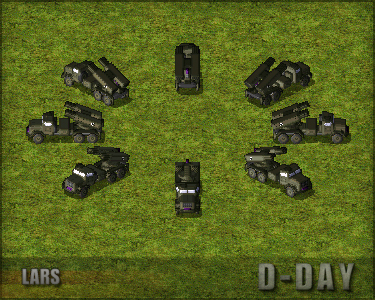 As usual for more information and pictures click on the unit name/animation to view their D-day Wiki page. Development of the Unimog series of trucks started in 1946 as a truck that could also be used as an agricultural tractor allowing great versatility for farmers struggling in the post-war period. The first prototype was ready at the end of 1946 and after trials and adjustments was put into mass production at the end of 1947. 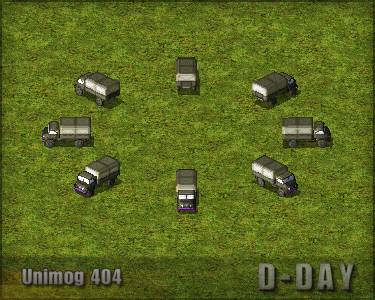 In 1951 Daimler-Benz bought the Unimog company and in 1953 launched two new versions, the 401 and 402. In 1955 with the formation of the Bundeswehr Daimler-Benz designed a new 404 version of the Unimog truck specifically for military service. Production started that same year and continued until the 1980s, with various upgrades being made over the years but still keeping the same rugged and proven design of the original. The civilian version of the Unimog also continued to evolve over the years and remains in production this day. The Spähpanzer Ru 251 was designed in 1960 to replace the M41A1 Walker Bulldog that the Bundeswehr had been using in the reconnaissance role. Prototypes where built in 1963/64 and underwent testing, it was however decided to cancel the project as the newly deployed Leopard 1 tank was just as if not more capable of fulfilling the intended reconnaissance role. Documents related to the development of the Ru 251 are still considered classified material by the Bundeswehr and the surviving prototype is kept in a secure storage facility, as such there is only basic information available and a few photos from during it's testing. Recently someone working at the storage facility managed to take and release several photos of of the prototype tho, marking the first time it has been seen in several decades. 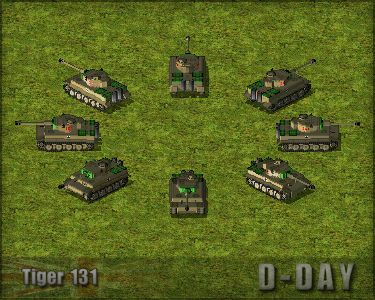 In the mid 1950's the newly formed Bundeswehr put out a request for a new tank destroyer. The German companies Henschel and Hanomag jointly worked on a design together, as well as the Swiss company MOWAG. In 1960 both had finished prototypes that where given to the Bundeswehr for trials. The Henschel and Hanomag design was chosen and in 1965 was put into production as the Kanonenjagdpanzer. In the 1970's the Soviets introduced new Soviet tanks with thicker amour, this rendered the Kanonenjagdpanzer's 90mm cannon obsolete. Plans were made to refit the Kanonenjagdpanzer with the 105mm L/7 cannon to combat this new threat, instead it was decided to remove the gun a fit the Kanonenjagdpanzer with an anti-tank missile system on it's roof, this new modification was called the Raketenjagdpanzer Jaguar. Development of the Leopard tank started in 1956 as a part of a joint project between Germany, France and Italy to create a new standard European tank (a.k.a. the Europa-Panzer). In 1960 Porsche, Rheinmetall (Germany) and AMX (France) submitted prototype tanks for evaluation. Disagreements in the design and manufacturer of the tank put a strain on the project and political changes in France further exacerbated problems. 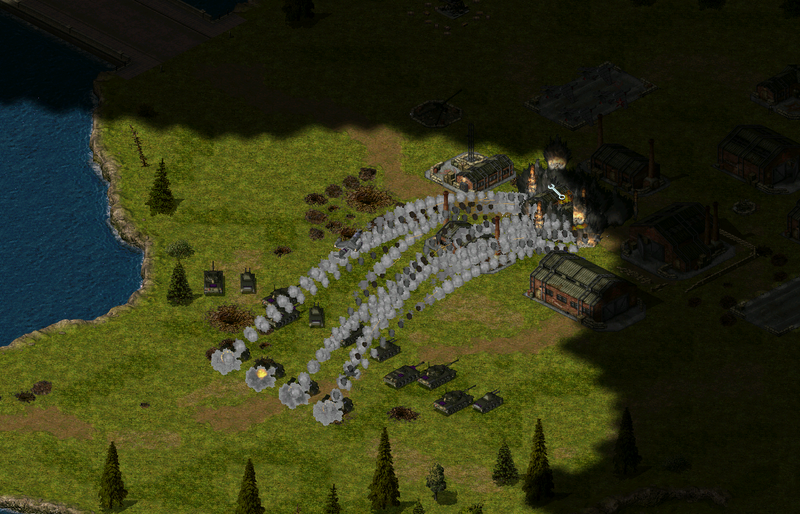 So Germany and France decided to end the partnership and continue development of their own designs independently. For Germany Porsche's design was chosen and after a second prototype and a limited run of 50 pre-production vehicles it started mass-production as the Leopard tank in 1964. The Leopard went on to also became a huge success on the export market, being bought by many European countries thus largely fulfilling it's originally intended role of being a standard European tank. While being largely replaced by the Leopard 2 in Europe the Leopard 1 is currently still in active service in several South-American countries. The Light Artillery Rocket System or LARS was a multi-barrelled rocket launcher fitted on the back of a Magirus 6x6 truck. It could fire 36 110mm rockets which could be fitted with various warheads ranging from anti-personnel, anti-tank and parachute equipped mines. 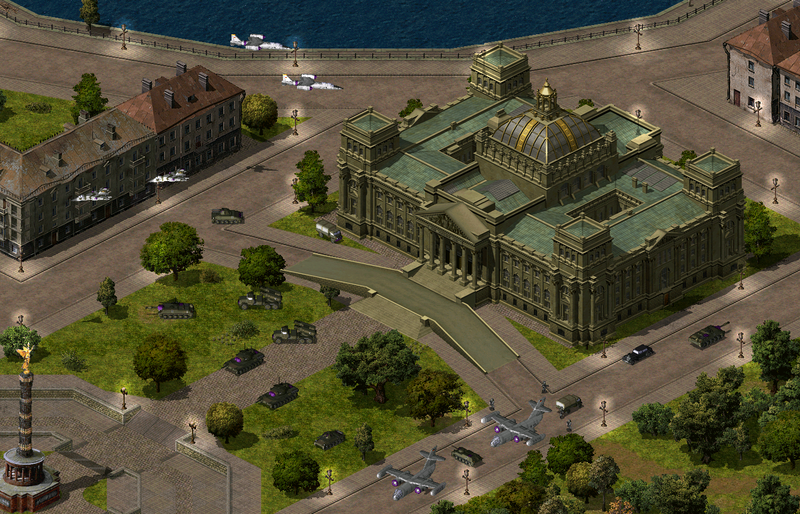 Development started in the mid 1960s and it came into service with the Bundeswehr in 1969. In the 1980s the system was upgraded by changing to a new armoured MAN 6X6 truck which is know as the LARS 2, with the original design becoming the LARS 1. In 1998 LARS was replaced in front line service with the American M270 MLRS but two hundred of them are still in reserve storage. During the Cold War the West German Airforce expected their airfields to be a primary target in any conflict with the Soviets. 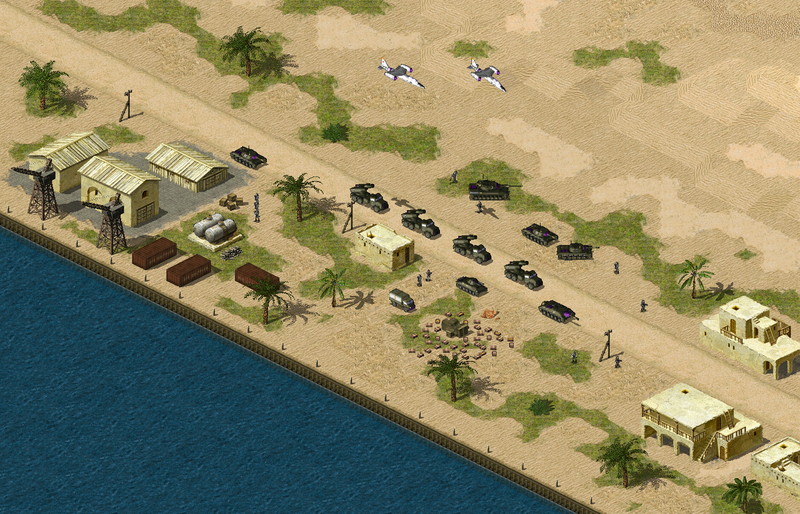 To counter this they planned to adopt a mobile strategy with heavy use of new VTOL aircraft that in a time of war could be operated from makeshift runways or the autobahn. To fulfil this new strategy Heinkel (VJ 101A), Messerschmitt (VJ 101B) and Bolkow all submitted different designs for a new VTOL fighter/interceptor. Instead of making the three companies compete for the production contract the Defence Ministry encouraged them to work together, so in 1959 the three of them joined together to create the EWR (Entwicklungsring Süd) consortium. The new jointly designed VJ 101C incorporated the best features from the original concepts, with Heinkel's wing mounted engine pods and Messerschmitt's fuselage lift fan being combined to provide the aircraft's VTOL capability. In early 1960 a rudimentary test rig was built to test the feasibility of the VTOL engines, a skeletal prototype was then built and in May 1961 underwent testing on a telescopic column. Work continued on improving this prototype and in March 1962 it was able to fly freely on its own. With the success of these tests a full prototype (X-1) was built and flew for the first time on April 10th 1963 and the first transition from vertical to horizontal flight was achieved on September 20th 1963. On September 14 1964 the X-1 prototype crashed and was destroyed during take-off, it was later found that a roll rate gyro had been installed backwards causing the autopilot to malfunction. A second prototype (X-2) completed in mid 1965 and along with fixes to the autopilot it also featured newer engines fitted with afterburners, it achieved its first VTOL flight on October 22th 1965. Testing of the X-2 prototype continued for several more years and plans were made for construction a larger and more advance EWR VJ 101D design, however changes in strategic requirement meant that interest in the EWR VJ 101 diminished and in 1968 the project was cancelled. The X-2 prototype survives to this day and can be found in the Deutsches Museum in Munich. Following the cancellation of the VJ 101 EWR continued work on several conceptual designs (The AVS project in partnership with Boeing and the EWR A 400 STOL Design Study), these slowly evolved the original VJ 101 design and culminated into the Panavia Tornado. The Fw-860 was an unique VTOL aircraft designed in partnership between Focke Wulf and the French company SNECMA, the French version being known as the AP 519. While most VTOL design used lift fans or rotating engines to achieve vertical flight the Fw-860 instead would take off and land on it's tail, in a similar fashion to a rocket. This tail-sitting method while requiring complex landing gear had advantages of needing less complex VTOL engines, saving wight and space within the aircraft making it possible to produce a more compact design. A major problem with this design though is that the pilot's view is restricted to looking up vertically at the sky when taking-off/landing, to solve this the nose section of the Fw-860 would be able to rotate 90 degrees giving the pilot an unrestricted horizontal view. This unusual aircraft never left the concept stage and work instead moved to more traditional VTOL designs. 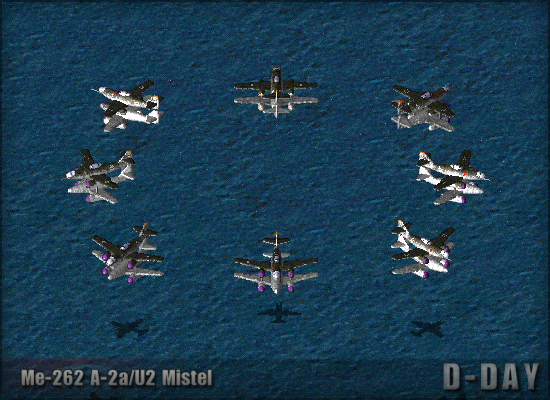 The Dornier Do-31 was a VTOL transport aircraft designed to be used along with the EWR VJ 101 VTOL fighter plane as part of West Germany's mobile defense strategy. Development of the Do-31 started in 1959 with a test rig being completed in 1962 which was used for several years to work out the problems with this large and ambitious design. Three different prototypes were then completed during 1967. The first prototype (Do-31E1) was only fitted with Bristol Pegasus engines for testing the standard horizontal operations and flew for the first time on February 10th 1967. The second prototype (Do-31E2) was used for static ground tests and never flew. The third and final prototype (Do-31E3) was fitted with both Bristol Pegasus engines and the Rolls-Royce RB162 lift engines and was capable of full VTOL operations, its first flight was during July 1967 and the first vertical take-off was achieved on November 22nd 1967. During the 1969 Paris air show the Do-31E3 gave a demonstration, during which it set world records for speed, distance, altitude and speed and duration over a course. The Do-31 remains the only jet powered VTOL transport aircraft ever built and as such these records have yet to be challenged. Unfortunately for this unique aircraft changes in strategy and the high cost of the project lead to its cancellation in 1970. 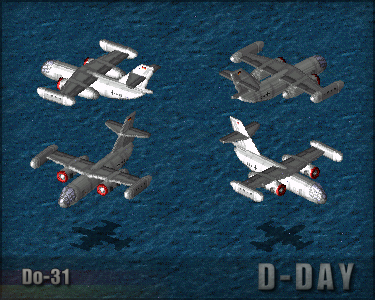 Dornier also put forward a proposal for a larger civilian passenger version called the Do-231 but couldn't find any airlines interested in purchasing it so it failed to leave the drawing board. Two of the prototypes still exist today, Do-31E1 can be found displayed at the Dornier Museum in Friederichshafen and the Do-31E3 prototype is located within the Flugwerft Schleissheim aviation museum in Oberschleißheim. The second prototype Do-31E2 was scrapped soon after the project was cancelled. 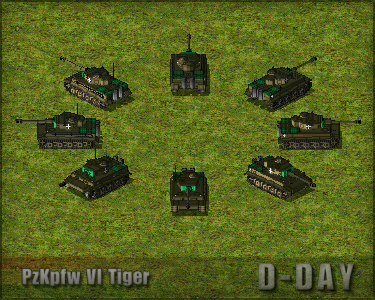 The Panzer VI Tiger is arguably the most famous and recognizable tank in the world, becoming the icon of the German tank forces of World War II. It's use was not limited to the German army though, several other countries used or planed to use Tigers during and after the war. Here are a few of them. 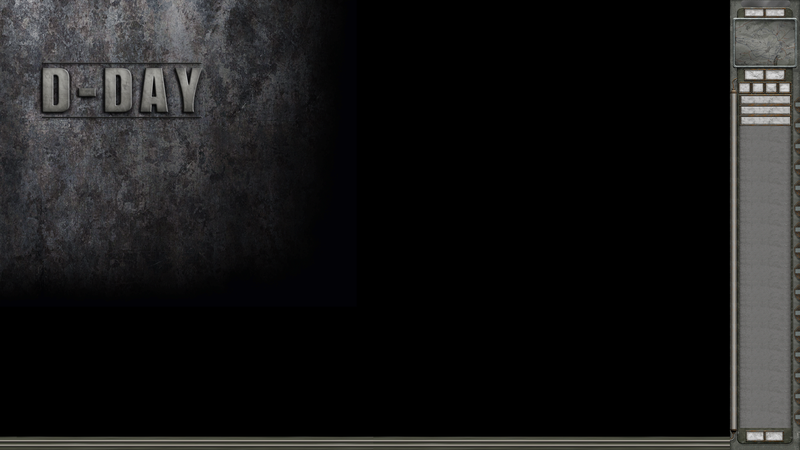 For more information and pictures click of the unit names to visit their D-day Wiki pages. In April 1943 the Japanese sent 12 army officers led by Colonel Ishide to Germany to inspect and test their latest tank designs. The Japanese where quite impressed and negotiated to buy four of the tanks and their related documents and blueprints, the PzKfw III Ausf.J, PzKfw III Ausf.N, PzKfw V Panther Ausf.D and PzKfw VI Tiger. They hoped that they could be reverse engineered and the technology incorporated into Japanese designs. One of the PzKfw III's was dissembled and along with the documents transported back to Japan via submarine. February 1944 the Tiger tank was moved to Bordeaux in France so it could be prepared for transport. With the worsening war situation and then the Allied Landings in France it became impossible to transport the tank to Japan. In September 1944 the Japanese decided to give the tank back to the Germans where it was soon destroyed fighting in Belgium. 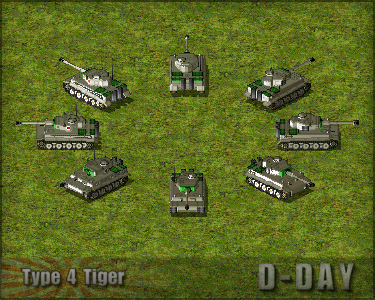 Note: The Germans charged the Japanese twice the normal price for the tiger. So in keeping with historical accuracy in D-day the price of the Type 4 is double that of the German version. In May 1944 the Germans gave 10 PzKpfw VI Tiger tanks to the Hungarians and then a further 3 more as a birthday gift to the Hungarian Inspector of Engineers Laszlo Hollósy kuthy. They served in the Hungarian 3rd Tank Regiment, where in July they took part in the battle for Galizien district in Southern Ukraine. By December 1944 only 4 of them where still active, the fate of the final 4 is unknown but they where presumably destroyed during the Soviet invasion of Hungary. 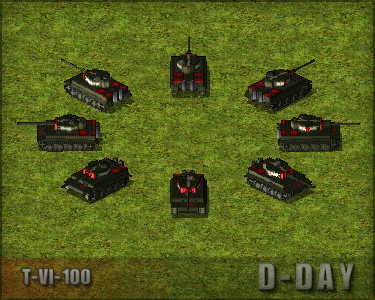 During the course of World War II Soviet forces where able to capture many German tanks in various states of disrepair, if at all possible they would be put into services against their former owners. 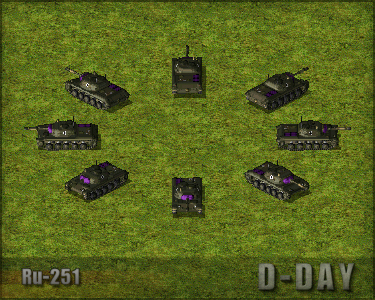 These tanks generally had a short life span due to limited spare parts and ammunition. In an effort to help elevate the later problem several projects where started to refit the German tanks with Soviet weapons. One of these was the T-VI-100 which replaced the PzKfw VI Tiger's 88mm KwK36 L/56 with the 100mm D10 which was used on the SU-100 and later the T-54. As the war progressed the Soviets where able to produce an ample amount of tanks so the need to refit the German tanks diminished and the project was cancelled in 1945. After the war a single Tiger tank was recovered from the battlefield and repaired by Skoda for use as a test bed for fitting their prototype 75mm A18 cannon. The A18 was originally built for use in the T-25 medium tank, the T-25 however was never put into production and it wasn't till now that the Skoda team could test it in a suitable vehicle. While the 75mm A18 was less powerful then the original 88mm KwK36 it was fitted with an auto-loader and drum magazine witch greatly increased the tanks rate of fire. Currently there are no known photographs of this unusual modification. Note: To simulate the auto-loader and drum magazine this unit has a limited ammunition supply that can be fired quickly but then takes some time to reload. Tiger 131 is the only working PzKfw VI Tiger tank in the world, it currently resides in Bovington Tank Museum and features as the main star in the museum's yearly tank festival. Tiger 131 was constructed in February 1943 at the Henschel factory at Kassel and was then sent to Tunisia in North Africa. On 20th April 1943 it took part in the battle for Djebel Djaffa hill, during witch it received several hits form British Churchill tanks that jammed the turret and gun, as well as injuring the driver and gunner. The crew then bailed out leaving their disabled but still intact tank for British forces to capture. The tank was repaired using parts from other knocked-out tigers and sent back to Britain where it was displayed as a war trophy in various locations around the country for the rest of the war. In 1951 it was then donated to Bovington Tank Museum who put it on static display for the next 40 years. In 1990 it was then removed for restoration which involved a complete disassembly and reassembly of all it's parts. As well as fitting it with a new engine from a Tiger II, as the original had been cut in half for display at the museum. The restoration of Tiger 131 was finally finished in 2003, becoming the only tiger tank in the world to be restored to working condition. Note: Because of the uniqueness of this tank and in homage of the fact it is the only working Tiger in the world, only one Tiger 131 can be built at a time. 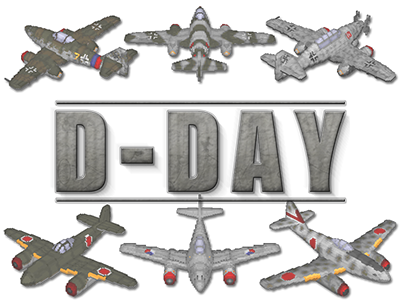 It's been quite awhile since I posted any new D-day news, that doesn't mean I've been sitting idle tho. I have lots of new (& old but unreleased) content to post, which I plan to start churning out on a weekly basis. To start things off tho here is a little known WW1 tank for the Italians. 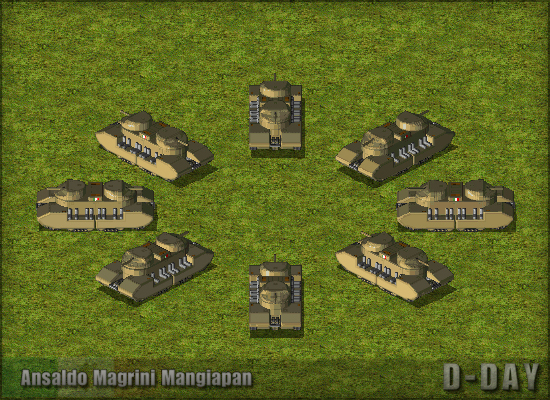 The Ansaldo Magrini Mangiapan was designed in 1916 by major Magrini as a "mobile fort" and was one of Italy's first tank designs. It featured multiple sets of tracks to help it traverse the crater filled battlefields of no-man's land. To power these tracks there were four 200hp engines in the centre of the tank which then drove two electric motors at the front and back, propelling this massive 70t vehicle to an estimated 20 km/h. It also unusually for that era featured two rotating turrets equipped with 76mm (some sources state 75mm or 105mm) cannons, as well as having multiple machine guns fitted around the hull. The design was approved by the direzione generale del regio esercito but was cancelled soon after because of the high cost and feasibility of such a complex design. Instead interest moved to the Fiat 2000 and purchasing tanks from France and Britain.